I am looking for a resource for Simmons Model 1403 89 270 Crib Parts as well as the assembly diagram from the instructions booklet. We retrieved this Simmons crib from the dump so I'm not sure of the date of manufacture or the name of the crib. All we can tell is that it is a Simmons Crib model 1403 89 270 baby crib. I know that we will need to buy some replacement parts but I won't know exactly which parts are missing without a parts diagram from the assembly instructions. Go here to find the hardware. If anyone has these instructions and would share them with me, I would be able to tell which pieces are missing and then I could make a decision as to whether it worthwhile to continue on my search for the Simmons Model 1403 89 270 Crib Parts or to abandon the project. If anyone has any suggestions for a resource that carries Simmons 1403 89 270 Crib Parts can you please contact me using the space below (and PLEASE include your contact information in case I need to get in touch with you!). Unique Baby Gear Ideas encourages our visitors to share their resources for the Simmons Crib Parts and assembly instructions that William needs. 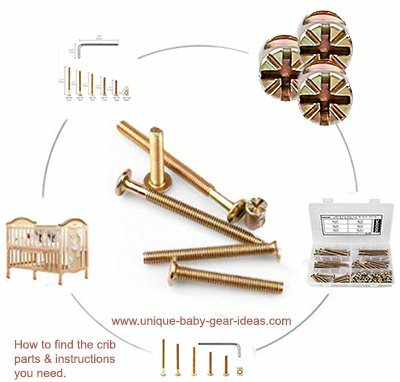 Plus, we appreciate your help in keeping up with crib recalls and to write reviews of Simmons baby cribs to make our little community of expectant parents aware of any problems that are associated with different models and brands.